A hormone produces its effect by binding to a target cell’s receptors for that hormone. The more receptors it binds to, the greater is the effect on the target cell. All hormones affect target cells by altering their metabolic activities. For example, they may change the rate of cellular processes in general, or they may promote or inhibit specific cellular processes. The end result is that homeostasis is maintained. Steroid hormones and thyroid hormones act on DNA in a cell’s nucleus and affect gene expression. 3. 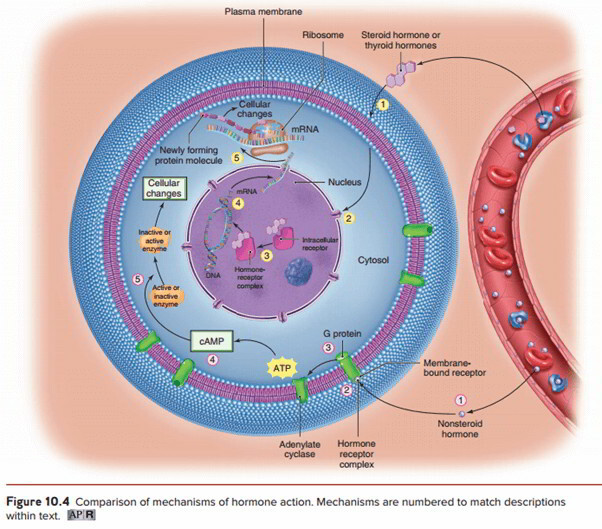 After a hormone enters the nucleus, it combines with an intracellular receptor to form a hormone-receptor complex. 4. The hormone-receptor complex interacts with DNA, activating specific genes that synthesize messenger RNA (mRNA). 5 The mRNA exits the nucleus and interacts with ribosomes, which results in the synthesis of specific proteins, usually enzymes. Then the newly formed proteins produce the specific effect that is characteristic of the particular hormone. Nonsteroid hormones are proteins, peptides, or modified amino acids that are not lipid-soluble, meaning they cannot pass across the phospholipid bilayer. Two messengers are required for these hormones to produce their effect on a target cell. The first messenger is the nonsteroid hormone bound to a receptor on the plasma membrane. The first messenger leads to the formation of a second messenger that is often, but not always, cyclic adenosine monophosphate (cAMP). The second messenger is formed within the cell, and it activates or inactivates enzymes that produce the characteristic effect for the hormone. When a cAMP is the second messenger, the sequence of events is as follows. (1)A nonsteroid hormone binds to a receptor on the target cell’s plasma membrane to (2) form a hormone- receptor complex. (3) This complex activates a membrane protein (G protein), which, in turn, activates a membrane enzyme (adenylate cyclase), (4) which catalyzes the formation of cyclic adenosine monophosphate (cAMP) from ATP within the cytosol. (5) The cAMP activates enzymes that catalyze the activation or inactivation of cellular enzymes, which produce the cellular changes associated with the specific hormone. Most hormone secretion is usually regulated by a negative- feedback mechanism that works to maintain homeostasis. When the blood concentration of a regulated substance begins to decrease, the endocrine gland is stimulated to increase the secretion of its hormone. The increased hormone concentration stimulates target cells to raise the blood level of the substance back to normal. When the substance returns to normal levels, the endocrine gland is no longer stimulated to secrete the hormone, and the secretion and concentration of the hormone decrease. Negative feedback keeps hormone levels in the blood relatively stable (figure 10.5). However, there are a few body processes that are hormonally regulated through positive-feedback mechanisms. (1) In hormonal control (figure 10.6a), the hypothalamus and anterior lobe of the pituitary gland release hormones that stimulate other endocrine glands to produce hormones. These hormones feedback and affect the function of the hypothalamus and anterior lobe. (2) In neural control, the nervous system stimulates an endocrine gland to produce a hormone, which affects target cells in the body. The actions of the target cells feedback on the nervous system to alter its activity. (3) In humoral control, a chemical change in the blood stimulates an endocrine gland to produce a hormone, which in turn affects target cells. The actions of the target cells then create a change in blood levels of the chemical, which feeds back and alters the activity of the endocrine gland. These feedback mechanisms may have either stimulatory or inhibitory effects on the hormone production pathway. The production of hormones is normally precisely regulated so that there is no hypersecretion (excessive production) or hyposecretion (deficient production). However, hormonal disorders do occur, and they usually result from severe hypersecretion or hyposecretion.